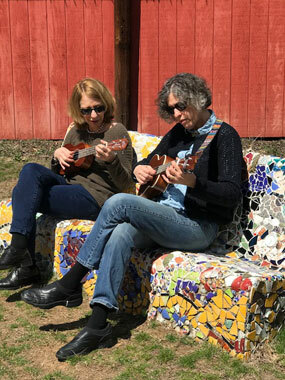 Roz Chast and Leslie Giuliani are close friends. Chast is a renowned cartoonist for the New Yorker who also has a zeal for some homespun crafts; Giuliani is a mixed media artist who works in a wide variety of old and new textile techniques. Both share an impulse toward narrative storytelling in their work. This exhibition shows that there are lots of creative ways to tell a story. Featuring Chast’s hand-hooked rugs (Giuliani was her teacher), embroidery, prints, and original cartoons, and Giuliani’s digitally-embroidered textile/paintings and richly-tactile encaustic works—including books — this show represents both artists’ urge to tell a story that can be made by, and held in, hand.